“Senorio” dates back to the 16th century and it is the home of the “Marques of Urbina de La Quintana”, a noble family serving the Spanish monarchy for more than 400 years. 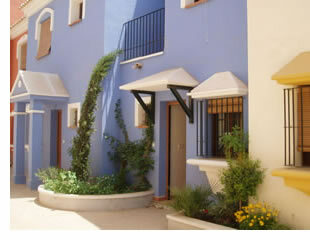 The buildings of the original “Senorio” are listed and protected by law due to its great historical importance. 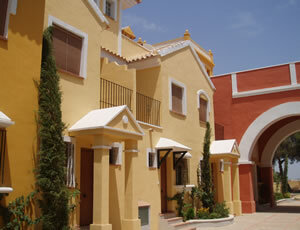 Within the grounds you will also find an exquisite church and beautiful lush gardens lined with palm trees. A team of historians, architects and artists have succeeded in the challenge of recreating a Spanish village with all the charm, craftsmanship and attention to detail of a residential area several centuries old. 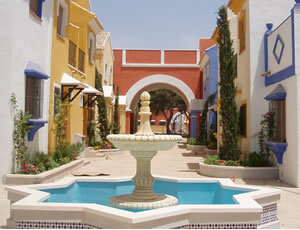 The 2 & 3 Bedroom Duplexes and Apartments have been set into blocks of two rows with archways at either side leading into terraced courtyards with fountains. The exterior colours (of light blue, Sand & terracotta) give this development a true feel of traditional Spanish style and elegance.